Led by UCL Urban Laboratory, Cities Methodologies is an ongoing programme of events and exhibitions dedicated to presenting, sharing and experimenting with new methods of urban research. Each iteration takes a new form. Audiences encounter an eclectic array of approaches to the analysis of cities worldwide. In 2014 the main Cities Methodologies exhibition will be held in October, but we are delighted to announce that this will be preceded by a programme of curated events and installations of research-in-progress at the Slade Research Centre, UCL, from 28 April to 2 May 2014. 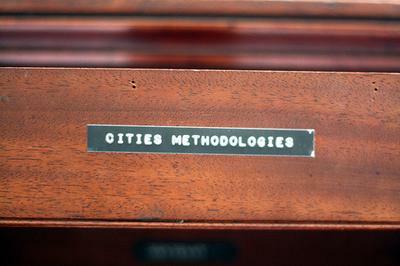 If you are interested in proposing an event or exhibit for the October 2014 programme of Cities Methodologies please note that the call will be announced in May, with details of this year's themes. We hope you will be able to join us in April for some of the exciting events we have planned, listed below. Programme updates and details on how to book for events will be posted shortly. During the 50th anniversary year of the coining of the word 'gentrification' by Ruth Glass, this event will reflect on her activities and ambitions, as well as those of the Centre for Urban Studies at UCL. With reflections from those who knew or worked with Ruth Glass, the event will build towards creating an archive of her life and work. Very limited spaces available and those who are undertaking research on Ruth Glass will be given priority. Please book via Eventbrite. Author, critic and UCL Urban Laboratory Literary Fellow, Ian Thomson, will lead an urban-themed writing workshop for UCL PhD and Masters students, on 28th April 10am to 1pm, with follow up writing tutorials on Friday 2 May from 10am. Ian will be reading new material from his work-in-progress book about the Estonian capital of Tallinn during World War II, and afterwards discussing representations of the city in literature in general. Students must be able to attend both days. Limited places available, please sign up via Eventbrite (UCL postgraduate students only). Venue: Meet under the trees in front of Central Saint Martins, Granary Square, King's Cross, N1C 4AA﻿﻿. As part of the Walking Methodologies programme within Cities Methodologies, this guided 'silent' walk takes participants on a choreographed route through the rapidly changing and increasingly contested public spaces of the neighbourhoods around Kings Cross. Guided by Tilly Fowler and Anna Hart from AIRstudio, Central Saint Martins, the walk is free and open to all, but places are limited. Please book via Eventbrite. Walking Methodologies roundtable takes place on Friday 2 May, and an exhibition accompanying the walks will be on display in the Slade Research Centre throughout the week. The cultural heritage constituted by our buildings and cities is becoming ever more important socially, culturally and economically across the world, precisely at a time when it is increasingly under threat of being erased through new development. How should we be investigating the built cultural heritage around the world under these conditions, and what kinds of strategies and policies ought we to be advocating? Venue: Meet under the portico of the Royal Exchange (outside Bank tube station). As part of the Walking Methodologies programme within Cities Methodologies, this two-hour, critical meander through the streets of London's financial district will uncover the social and spatial practices of finance, ranging from medieval alleys and seventeenth century taverns, to modernist 'streets in the sky' and the most high-surveillance squares in the world. Guided by Amy Thomas (PhD candidate and Teaching Fellow in Architectural History and Theory at the Bartlett School of Architecture, UCL). Please book via Eventbrite. Walking Methodologies roundtable takes place on Friday 2 May, and an exhibition accompanying the walks will be on display in the Slade Research Centre throughout the week. A one-day AHRC-funded seminar that examines current issues of UK housing through panels on: space and regulation, equality and affordability, and design and wellbeing. Speakers include: Alex Ely (Mae Architects); Phil Hamilton (Peter Barber Architects); Brian Quinn (CABE); Maddy Powers (Equality Trust); Andrea Phillips (Goldsmiths); David Roberts (UCL). For more information contact: Dr Peg Rawes, Bartlett School of Architecture UCL: m.rawes@ucl.ac.uk. Booking is free, via Eventbrite. UCL Urban Laboratory Leverhulme Artist-in-residence Rab Harling will exhibit his work in progress, photographing the Balfron Tower from inside out, at a key moment in the 'regeneration' of this iconic building. A round table event on the ethics of photographing and filming London estates will be held on 29th April. Booking for round table event required via Eventbrite. Andy Merrifield, Bartlett Visiting Research Fellow, will launch his latest book, The New Urban Question (Pluto Press, 2014), which traces the connections between radical urban theory and political activism. Andy will present his book, followed by a drinks reception. Curated by Dr Stamatis Zografos, this event and installation will examine different ways that fire can act as a methodology to access and explore memory in architecture. Considering that fire is an imminent threat to architectural memory, what is its impact on building heritage? Can this element be understood as a methodology to reconceptualise heritage and sustainability? Given that fire is commonly used as a tool to (re)claim civil rights, can it also be perceived as a methodology to rethink citizenship? Students from the MSc Social Development Practice programme at the Bartlett Development Planning Unit will present and discuss their use of participatory photography as a research method in their forthcoming fieldwork exploring democratic urban governance practices in the city of Kisumu, Kenya. The session will reflect on the value and challenges that photography can bring to participatory action research, whilst providing a space for responses to students' work. Under the London pavements are the city's lost rivers, hidden in tunnels and sewers. The most famous, the Fleet, runs straight through central London just below the surface, but few know it is there. Follow the lower Fleet from St. Pancras to Blackfriars with Tom Bolton, author of London's Lost Rivers, and hear how the river ran with blood, cured the sick, shaped the city and entered London myth. This guided walk is part of the Walking Methodologies programme within Cities Methodologies. Please book via Eventbrite. Walking Methodologies roundtable takes place on Friday 2 May, and an exhibition accompanying the walks will be on display in the Slade Research Centre throughout the week. A supposed divide between theory and practice raises a number of questions for those interested in making cities better. In this session, students from UCL's MSc Urban Studies programme will present group projects oriented around this theme. On topics ranging from social housing, parks and green spaces, gentrification, the preservation of historic markets, and the politics place-making, they'll consider how urban theory and research can inform, problematise and engage with the work of urban practitioners outside of the academy. How can local communities access technical expertise in a world class university? How can engineering research be shaped by community needs? These are the challenges driving the formation of the Engineering Exchange at UCL. This workshop will address the ethical and practical issues associated with setting up and running the Engineering Exchange. We are particularly keen for representatives of community based organisations to participate in the workshop to help formulate strategies and actions based on community needs and expectations. A seminar held in collaboration with Just Space to share technical expertise, research and evidence on issues related to the demolition and refurbishment of social housing in London, including health, energy, financial and architectural arguments. Limited places available, invite only. To receive an invite please email urbanlaboratory@ucl.ac.uk with a brief statement explaining your interest in the topic. As part of the Walking Methodologies programme within Cities Methodologies, this event is an opportunity to become an urban researcher, being sent on a collective scavenger hunt into hidden and unexpected places of London. On this 'walkshop' you will carry out game-like exercises that will help you question your surroundings and think about them in new ways - How can we re-imagine London? How can we question the (invisible) taken-for-grantedness of our everyday life in the city, break our routines and experience London differently? The walk is led by Sabeth Tödtli, Nina Lund Westerdahl, and Cecilie Sachs Olsen from zURBs. Please book via Eventbrite. Walking Methodologies roundtable takes place on Friday 2 May, and an exhibition accompanying the walks will be on display in the Slade Research Centre throughout the week. A number of free themed walks led by academics and practitioners will take place during the week, culminating in a round table event on Friday 2nd May exploring the idea of walking as methodology. Booking required via Eventbrite. Author, critic and UCL Urban Laboratory Literary Fellow, Ian Thomson, will provide a follow up writing tutorials for UCL PhD and Masters students attending his writing workshop on workshop on Monday 28th April. Please check back soon for details of how to sign up.